Fourth generation logger Bobby Goodson and his rugged crew of men battle the dangerous swamp to harvest valuable timber and haul it to the mill just to survive. But a harsh economy and shut downs at the mill will wreak havoc on this man and his business. Joy was born in Burgaw, N.C., in 1968. Not only is she Bobby’s only female driver, but she’s also Bo’s big sister. Driving is the only job Joy has ever done, and hauling wood is the only cargo she’s ever carried. 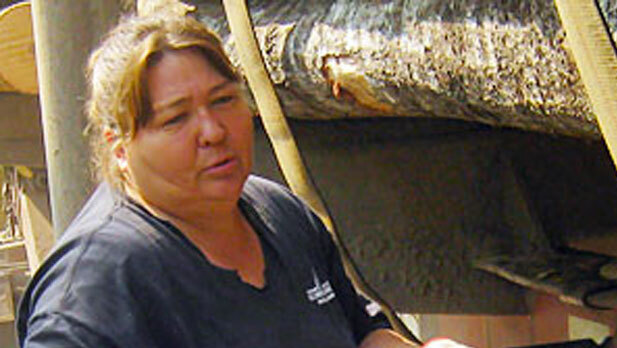 Joy took her first ride to the woods when she was 17 and started hauling timber when she was 18. She is a trucker through and through. Joy met her husband, Buddy, while they were both dropping off a load of wood at the same mill. She says that “he started talking smack, and a month later we were dating. That was 19 years ago.” Now motherhood gives Joy the greatest sense of fulfillment, although you can catch her now and again burning rubber at the local drag-racing track in her tricked out S-10 pickup truck. Fourth-generation logger Bobby Goodson was born in Jacksonville, N.C., in 1964 and started going to the woods soon after that. He landed his first logging job at 11 years old, when he spent the summer working for his father. But the highlight of Bobby’s life thus far came a couple of years later at age 13, when he met a local girl named Lori Mueller. They started dating a year later and have been together ever since. Bobby went to school and got a degree in graphic communications from Chowan College. But with the advent of computer graphics Bobby found his degree obsolete and went back to work for his father. In 1986 Bobby started his own company, but he didn’t start working the swamps with a shovel until 1996. Now, he proudly employs 17 people full time and, along with his son, Justin, owns his own slogging trucks. Bobby and Lori have two grown children and four grandchildren, with a fifth on the way. Justin Goodson has five generations of logging pumping through his veins and is his dad’s right-hand man. Born in 1980 in Jacksonville, N.C., to Bobby and Lori Goodson, Justin is Bobby’s eldest and only son. When asked how long he has been a logger, Justin will tell you, “my entire life.” Justin started working summers for his father at the age of 12. After high school, Justin enrolled at Coastal Carolina Community College, where he got a degree in diesel mechanics, a much-needed skill when Justin started working for his father full time at age 18. Growing up in a logging family has its advantages: Justin can run and repair every piece of equipment Bobby owns. Justin tells us that if he weren’t a logger, he would have gotten into law enforcement. But logging is what he does and does well. Justin has two sons and a daughter with his wife, Bethany. He hopes that the industry can hold up so that his boys can someday take over the family business. Bo is Bobby’s go-to driver when there is a company move. Bo started his professional life as a teen working on his uncle’s farm. They farmed soy, corn and tobacco until his uncle stopped farming. That’s when Bo turned to his father for some career advice. His dad gave him the same guidance he had given Bo’s sister, Joy — drive a truck. By age 19, Bo was driving a truck and hauling anything that needed hauling, but he didn’t start working for Goodson All-Terrain until late 2007, when Justin and Bobby bought their own trucks and hired Bo as a full-time driver. Twenty years ago, however, Bo’s trucking career almost ended before it had really even started. As a 19-year old greenhorn, Bo was hauling a full load of timber when an empty semi, heading in the opposite direction, hit his rig, sending it into the woods. His load of timber came through the cab and pinned his shoulder to the dashboard. Bo is thankful to be here today. When Bo is not hauling wood or hunting deer, he enjoys spending time with his wife, Angel, and watching his children, Harlie and Milton, play competitive sports. Dave’s sister, Lori, is Bobby’s childhood sweetheart and wife of more than 25 years. After high school and community college, Dave took his father’s advice and left Jacksonville to attend the prestigious Johnson & Wells University, where he studied for a degree in culinary arts and food and beverage management. But when his father was diagnosed with cancer, Dave put his dreams of becoming a chef on hold to be with his dad. Moving back home meant finding a job, and Bobby had one for him. Now that his father is cancer free, Dave has chosen to remain in the Jacksonville area to be near him. Married to his wife, Jennifer, with a cute-as-can-be baby girl, Dave dreams of one day returning to the kitchen. For now, however, he is content with cooking steaks for Bobby’s crew when they reach 100 loads in a single week. A native of Mexico, Simitrio was born in 1966 in a village so small that it doesn’t even have a name. The closest town, Espíritu Santo (Holy Spirit), is a two-hour walk away. As a teenager, Simitrio worked the local mines in his area. But after his cousin invited him to the United States to work, he quit his job in Mexico and started working the tobacco fields of North Carolina. When the season finished, the other workers went on to Florida for work. Simitrio stayed in North Carolina, and in 1987, he took a job with Bobby’s father and started working in the woods alongside Bobby. The two became instant friends, and when Bobby started his own logging company in 1989, Simitrio joined his crew. When Bobby bought his first feller buncher in 1992, Simitrio started operating it and has been stumping ever since. When he’s not running the most important piece of equipment in Bobby’s arsenal, Simitrio is a husband and proud father of four. Along with his wife, Dawn, he plays a very active role in his church, from leading the Spanish-language services to helping run the prison ministry program.